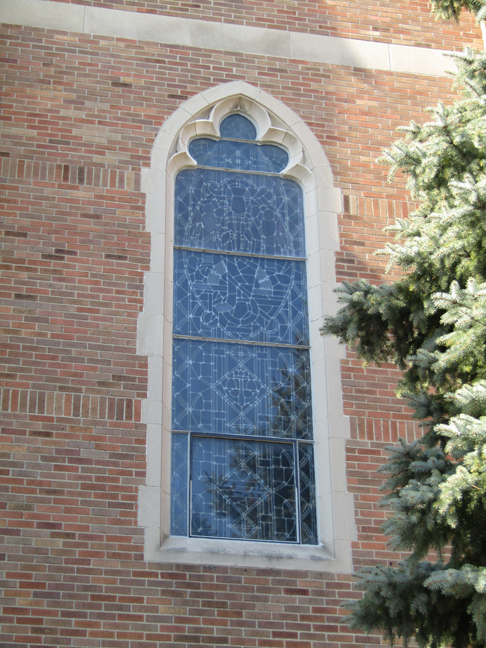 Brief Description of Subject: Window description: This window is one of two located in a small room in the epistle side of the narthex which now functions as a space for meditation. 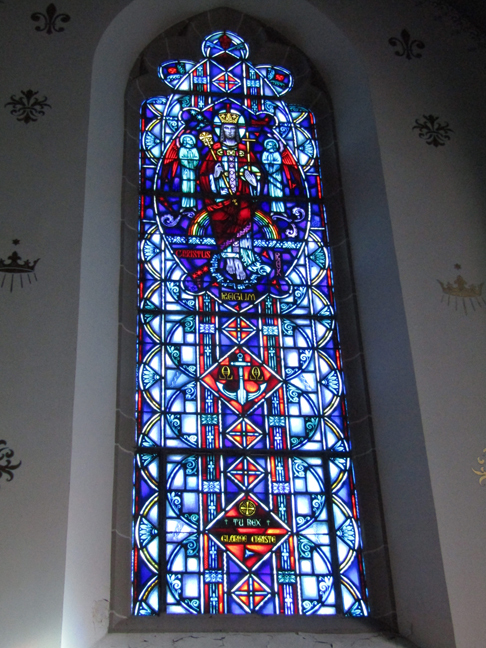 The underlying theme of this window is "Christ as King". The figurative part is contained in a lens-like shape with Christ seen with a crown (king), scepter (king), and globus cruciger (kingly power over the earth). Two angels are seen praising Christ in heaven ( rainbow and celestial objects). 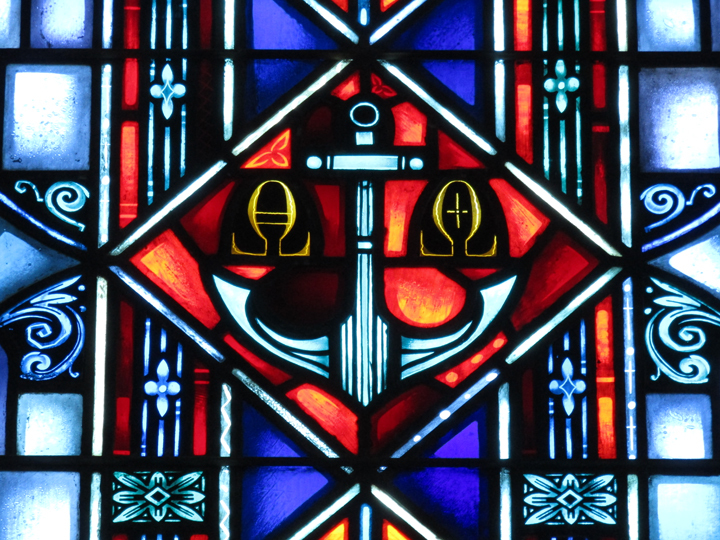 Below the lens is an anchor which symbolizes the hope we have in Christ (Heb.6:17-20). Note the anchor contains the shape of a cross. The Greek letters seen are "Alpha" and "Omega" (the first and last letters of the Greek alphabet) which comes from Rev.21:6 where Christ proclaims himself the "Alpha and the Omega" -- the beginning and the end. Below that is the quote from the "Te Deum". 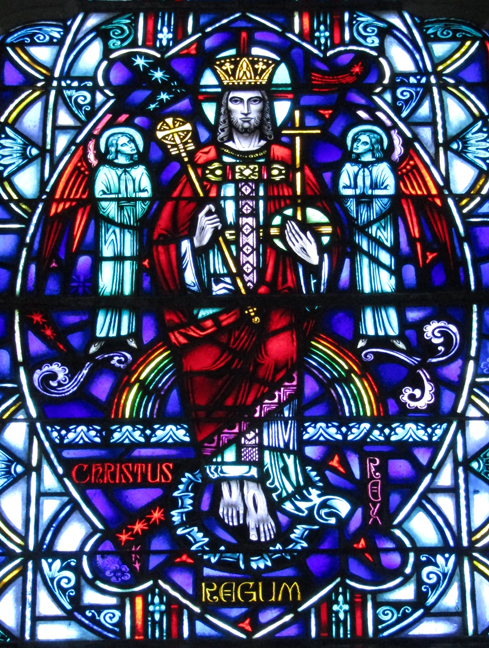 Background: Christus Rex Regum, "Christ the King of Kings" is from Rev. 19:16 . 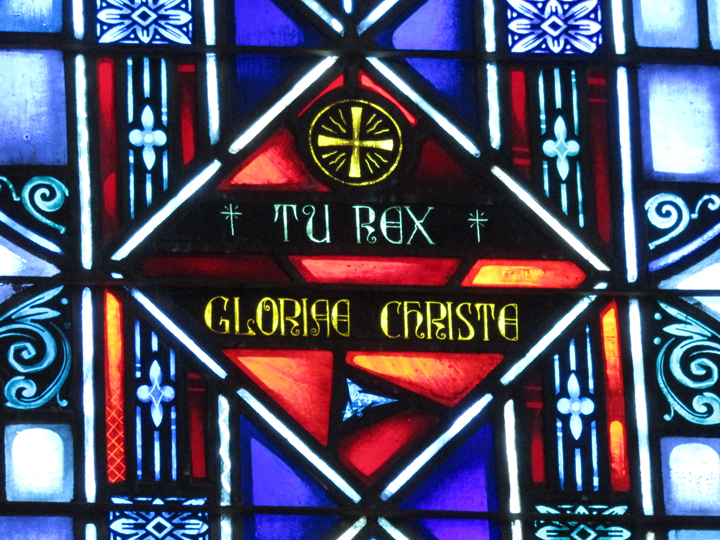 TU REX GLORIAE CHRISTE, "Thou art the King of Glory. O Christ" is taken from the prayer "Te Deum"; from that same prayer -- "To you all angels, all the powers of heaven, Cherubim and Seraphim, sing in eternal praise."